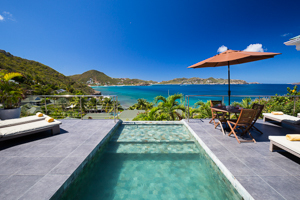 Villa UJV 374, also known as Villa Mirande, is a three bedroom villa in the heart of Pointe Milou. The interior is strictly modern, with a large glass dining table, and black granite counter tops complementing white lacquered cabinets in the kitchen. The living room opens to a large deck with plenty of loungers and a small plunge pool with infinity edge. The kitchen comes with all modern amenities and even an extra refrigerator (the living room and kitchen areas can be air-conditioned when the shutters are closed). There are two, equal master bedrooms on either side of the living room. Each is full-eqipped and has a queen bed. A modern bathroom with extra large showerheads connects to each bedroom. A third bedroom, on the lower level, is also fully-equipped, and furnished with two twin beds that can be made up as a king. On the same level, on the other side of the house, is a fully-equipped fitness room with an independent, full bathroom. Enjoy the famous Pointe Milou sunsets from the deck, or even from the living room. Due to its layout, the villa is not suited for children under 10. This villa is ideal for two couples traveling together, but also for people with teenagers. Air Conditioning in the bedrooms. A/C in the living room/kitchen area when the shutters are closed only.